Derek Ratchford is now working with us as our new Associate Teacher! He'll be helping out with curriculum, teaching, and events. We're excited to have him as a part of the NWA3D team! Derek Ratchford grew up in Marshall, AR. He attended the University of Central Arkansas where he earned both his Bachelor of Science in Economics and Masters of Arts in Teaching. Derek has been working for the the Springdale School District for the past three years as certified teacher and is currently the EAST Facilitator at Sonora Middle School. When he is not teaching and learning about new technologies, Derek enjoys getting outdoors through hiking or canoeing with his family. 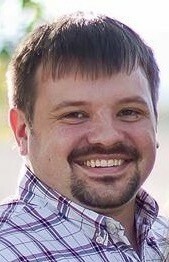 Derek and his wife currently live in Springdale, AR with their three children.